Spring has Sprung.... APRIL FOOLS! Old man winter plays a cruel joke on Northeast Ohio with 3-5 inches of snow. This was just in time for April Fool’s day, which just happens to coincide with the Cleveland Indians Home Opener. 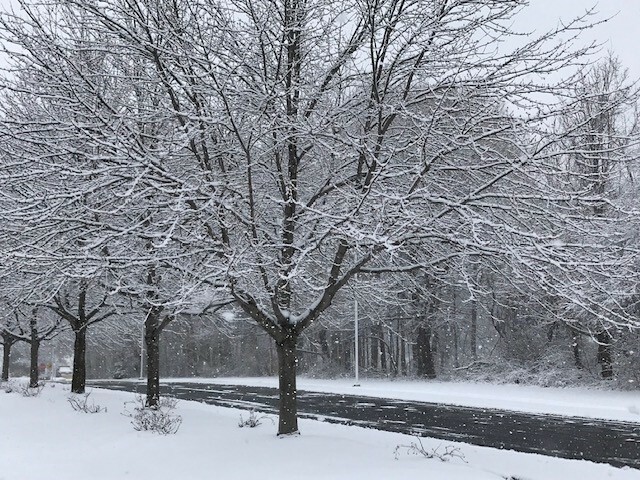 Snow began falling Saturday, March 30th after heavy rain and falling temperature and continued through the night into Sunday, March 30th, 2019 and throughout the day. The result was a cruel April Fool’s joke. I thought spring came on March 21st, 2019 with the Vernal Equinox. Surprising, the Vernal Witch hazels have not come into full bloom as I write this article. The result of wet stems followed by snow left the landscape beautiful. Nurseries have not uncovered their hoop houses. However, nurseries have been digging nursery stock over the past few weeks. To put our weather in perspective, we are at Growing Degree Day 43 as of April 1st, 2019 in Perry, Ohio. Last year, we were at Growing Degree Day 60 but had several days in February over 70 in February 2018, which was not the case in 2019.